I'm mean when it comes to lures, there's no doubt about it. I'm certainly not given to changing my lure every ten minutes if bites are not forthcoming. The other day my wife said "Why don't you go fishing?" and I needed no second bidding. I pondered on whether to bother catching some bait, decided against it, had a spot of lunch, grabbed my spinning rod and set off for the river. It had been one of the many frosty mornings we've had lately and although the sky was blue and the sun was shining brightly, as I walked down through the fields the thin ice on the puddles crackled under my boots. In the patches of shade the grass was still white with frost. I'd forgotten my gloves so it was pretty chilly on the backs of the hands. I walked to the first pool, probably the biggest slack on the beat, and had a couple of gentle casts, just to get 'the feel' of the lure which was a ten-inch rubber creature given to me by my pal Terry in January 2005. It has a wonderful wriggly tail and looks just like an eel even under the slowest retrieve. These things are made with a big lump of lead in the body but to be honest they could do without it and would fish best with just a hook (DOES ANYONE KNOW WHERE I COULD GET JUST THE BODIES OF SOMETHING SIMILAR????). 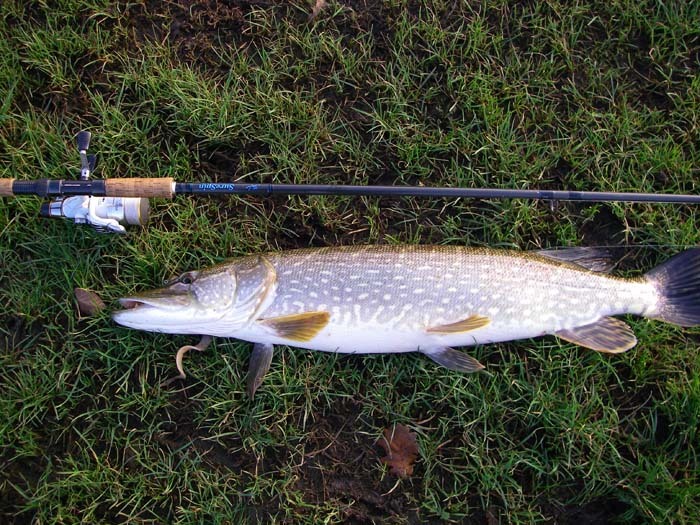 Anyway, my one has caught lots of pike now and is beginning to look the worse for wear. In truth I can't see it lasting much longer. To get back to the fishing. On my third retrieve I lifted the lure from the water for another cast and as I looked down there was an almighty boil by my feet. 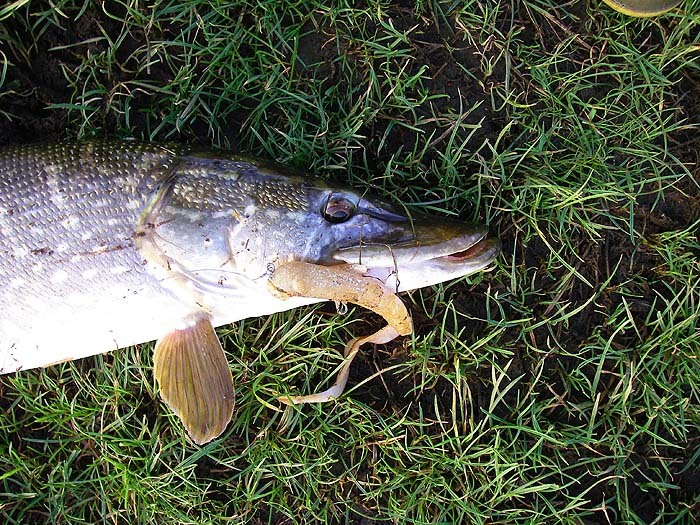 I didn't see a fish but it was obvious that a decent pike had followed up to the bank and swirled away - a good sign! 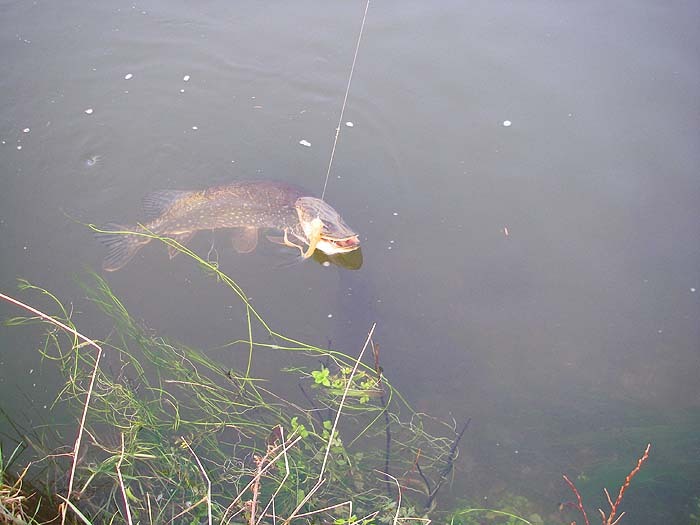 I made a short cast and watched as the lure wriggled back towards me in the gin-clear water. 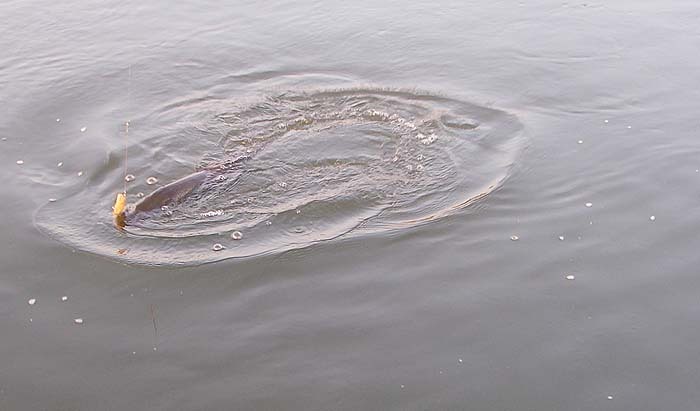 As it 'swam' past a small patch of floating vegetation, just beyond the rod tip, a green torpedo launched itself from the cover, came right out of the water, totally missed the lure and crashed back in with a big splash. It was obviously hungry. Two or three more casts with nothing happening but I was fairly sure that the fish would have another go and, sure enough, suddenly it was on. The strike was a reflex and the fish was well hooked. For probably five minutes it was give and take, with the camera on one hand and the rod in the other, before I could slide my fish onto the soft, wet grass of the bank. It was probably about seventeen pounds I thought, not a bad start. The next pool produced another swirl but this one would not have another go (that's why it's always worth having a natural bait handy). To cut a long story short I fished on for the best part of an hour with no more bites. On the way back to the car I dangled the lure in the spot that had produced the first fish - just out of curiosity. It lunged out and missed so I packed in and went home.